Three out of four Russian agents expect to refer more students abroad in 2017 than they did last year. This is one of the top-level findings of a survey of leading Russian education agents conducted by ICEF Monitor this week. It is also one of the latest indicators that the Russian market – which has been mired in a deep recession for the last two years – is now poised for recovery. Simply put, the Russian economy found bottom in 2016. Two years into an economic downturn that was largely precipitated by falling commodity prices – and especially oil prices – the economy slightly outperformed analyst expectations for 2016. It still shrunk during the year, but less so than most had expected. And the forecast for 2017 is for modest growth, anywhere from .8% to 1.5% of GDP depending on who you ask. As on the way down over the last two years, the path to growth this year has a lot to do with rising world oil prices, which have increased by about 20% over the last few months alone. And as goes the world commodity index, so goes the rouble. The Russian currency has strengthened against the US dollar by about 25% over the last 12 months. A year ago, it took about 80 roubles to buy a US dollar, today it costs just under 60 roubles. This is still some distance off the pre-recession exchange levels of roughly 30-35 roubles to the dollar (as of the beginning of 2014), but nevertheless represents a dramatic improvement over the exchange rate from early 2016. During the same period, the rouble has also strengthened about 33% against the Euro, and in the range of 20% (or better) against other major world currencies. Not surprisingly, the Russian tourism sector was marked by two contrasting trends over the last two years: international trips plummeted (down 24% last year) even as domestic tourism enjoyed a banner period with nearly 90% growth in 2016 alone. This is a vivid illustration of how an economy responds to crashing currency values: people still travel but they do so closer to home and with their local currency. The outlook for the year ahead, however, is again more positive as the economic recovery begins to take hold. ITB Berlin projects an overall 2% increase in Russian outbound travel for 2017. More recently, however, the Association of Tour Operators of Russia reported a 10% year-over-year increase in travel abroad by Russians during the 2016/17 holiday season. There are indications that Russian demand for higher education abroad was surprisingly resilient during the recession. UNESCO, for example, reports that Russian outbound for higher education was up 7.1% between 2013 and 2015, with about 55,000 students enrolled abroad in 2015. What we might expect now is that more discretionary student travel – such as language studies or camps – will also be on the upswing in 2017. 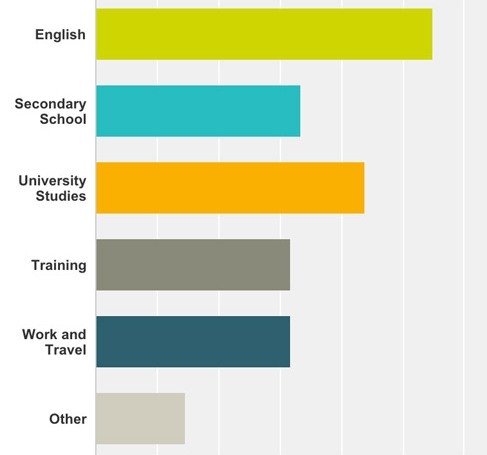 Indeed, the agents responding to our survey this week weighted English language programmes, secondary school, and university studies as the areas of greatest demand for 2017. 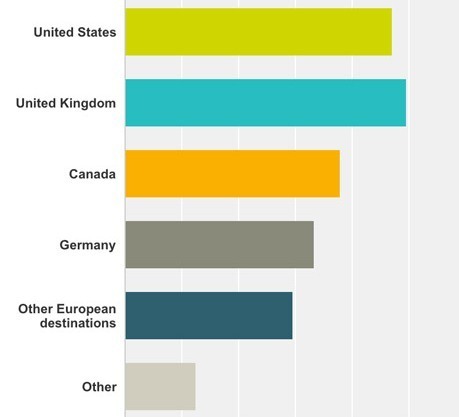 Survey respondents also noted the US, the UK, Canada, and Germany as the most attractive destinations for Russian students this year. When asked what foreign educators can do this year to be successful in recruiting in Russia, responding agents offered a couple of consistent themes: be present and be responsive. These echo the similar points that we consistently see in the annual Agent Barometer survey, but it is clear as well that Russian agents want the institutions they represent to be directly engaged with marketing efforts in-country, whether that means education fairs, regional tours, staff training, or other direct support for the agent’s recruiting efforts. This entry was posted in Agents, Europe, Most Popular, Regions, Research, Russia and tagged language learning, Most Popular, student recruitment, universities with international students, undergraduate student recruitment.